Provides a method to measure the distance of lateral flow of Self Consolidating Concrete. Determine the potential static segregation of self-consolidating concrete. Stainless steel construction with 10L capacity. Determine flow rates and passibility of SCC in confined spaces. Self-consolidating concrete should be tested for flow rates, passing ability, levels of aggregate segregation resistance, evaluation of filling and static segregation. Testing of self-consolidating concrete eliminates the need for vibration or other techniques to remove air bubbles and holes. Self-consolidating concrete, when used correctly, was created to avoid this problem and reduces labor, time, and a possible source of technical and quality control issues. 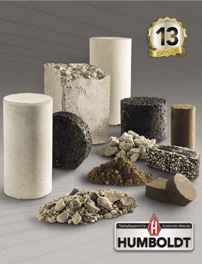 Humboldt offers a variety of tools to assist testing self-consolidating concrete to ensure a less labor-intensive task. Check out Humboldt's Penetration Apparatus, J-Ring Test Set, Static Segregation Column, V-Funnel Test, and L-Box Flowability Test for top performance of self-consolidating concrete. If you have questions or need help selecting equipment, please call us at 1.800.544.7220 or use our Quick Response form.